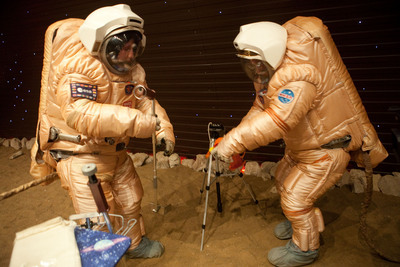 Crew training for ‘Marswalk’ at the simulated martian terrain of the Mars500 experiment. (Credits: ESA/IPMB). Russian scientists processing data from the Mars 500 experiment stated that extreme radiation on the Martian surface can increase the risk of DNA damage, resulting in cancer or other serious diseases. General changes in health resulting from genetic mutations are deemed one of the most dangerous pitfalls of outer space exploration. The results of Mars 500 were presented at an International Symposium held in Moscow in late April. “According to our estimates, researchers on the surface of Mars can expect a number of adverse factors, such as cardiac arrhythmia, reduced stability and performance, sensory impairments, as well as more long-term consequences in the form of changes at the DNA level, and demineralization of bone tissue,” said Anatoly Grigorev, the deputy head of the Russian Academy of Sciences. 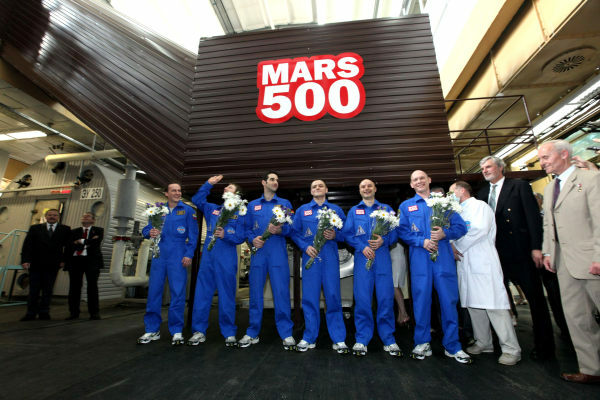 The Mars500 crew shortly after completing their 520-day Mars mission simulation inside the special isolation facility. (Credits: ESA).